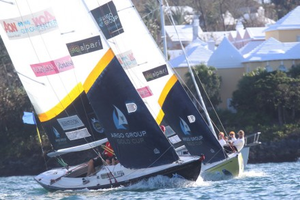 October 6th through 11th is the Argo Group Gold Cup - the penultimate event on the 2015 World Match Racing Tour. 16 teams will be sailing International One Designs focusing on getting their name on this prestigious King Edward VII Gold Cup trophy alongside many of the greats in our sport but some will also be keeping one eye on the overall championship points! With a bullet in the eighth race, Jonathan Farrar of Fishers Island, NY clinched the International One Design World Championship with a race to spare, winning the title earned by his father Kevin eleven years ago. 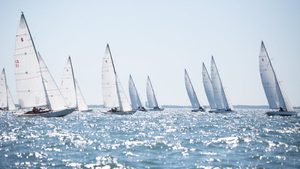 Farrar won three of the nine races in the fourteen-team regatta on Nantucket Sound to finish one point ahead of last race winner Martin Rygh of Norway. North East Harbor sailor John Henry placed third, ahead of local champ Robert Constable of the host Nantucket fleet. It was a classic case of coup de foudre, as the French call it: love at first sight. 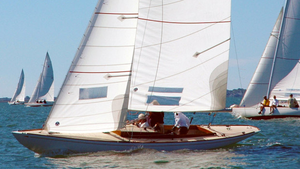 Copyright © 2019 San Francisco Bay International One Design Fleet. All rights reserved.